Hani Hanjour was the hijacker-pilot of American Airlines Flight 77, flown into the Pentagon as the third of the four 9/11 plane hijackings.National Commission on Terrorist Attacks upon the United States, Thomas H. Kean, and Lee Hamilton. 2004. The 9/11 Commission report: final report of the National Commission on Terrorist Attacks upon the United States. (Washington, D.C.): 10; 239, http://govinfo.library.unt.edu/911/report/911Report.pdf. Hanjour underwent pilot training in the United States in the 1990s, as the only pilot trained prior to being selected for the 9/11 plot.National Commission on Terrorist Attacks upon the United States, Thomas H. Kean, and Lee Hamilton. 2004. The 9/11 Commission report: final report of the National Commission on Terrorist Attacks upon the United States. (Washington, D.C.): 225-6, http://govinfo.library.unt.edu/911/report/911Report.pdf. According to findings from the 9/11 Commission, Hanjour was specifically assigned to attack the Pentagon because he was the operation’s most experienced pilot.National Commission on Terrorist Attacks upon the United States, Thomas H. Kean, and Lee Hamilton. 2004. The 9/11 Commission report: final report of the National Commission on Terrorist Attacks upon the United States. (Washington, D.C.): 530, http://govinfo.library.unt.edu/911/report/911Report.pdf. The 9/11 Commission Report summarizes Hanjour’s upbringing and some details regarding his path to radicalization. Hanjour reportedly traveled from his hometown of Ta’if, Saudi Arabia, to Afghanistan in the 1980s to participate in jihad against the Soviets, but ended up working in a relief agency because the war had already ended when he arrived. Hanjour, a “rigorously observant Muslim,” according to the Commission, first came to the United States in 1991 to take English as a Second Language classes at the University of Arizona. He returned again to the United States in 1996 to attend flight school, enrolling at schools in Florida, Arizona, and California, but did not progress far in his training and soon returned to Saudi Arabia. In 1997, Hanjour again returned to Arizona to undertake flight training, obtaining his private pilot’s license and, in April 1999, his commercial pilot certificate from the Federal Aviation Administration. The 9/11 Commission notes the possible significance of Hanjour’s time in Arizona, mentioning that Hanjour was known to have associated with other extremist individuals there. According to the report, various al-Qaeda-affiliated individuals lived in Tucson or attended the University of Arizona in the 1980s and 1990s, and other known extremists enrolled in aviation training there.National Commission on Terrorist Attacks upon the United States, Thomas H. Kean, and Lee Hamilton. 2004. The 9/11 Commission report: final report of the National Commission on Terrorist Attacks upon the United States. (Washington, D.C.): 225-6, http://govinfo.library.unt.edu/911/report/911Report.pdf. After leaving the United States in April 1999, Hanjour spent some time at home in Saudi Arabia. He applied to a flight school in Jeddah, but was rejected. At some point, he told his family he was leaving for the United Arab Emirates to work for an airline, but is believed to have traveled to Afghanistan during this time instead. Hanjour was known to be in Afghanistan by the spring of 2000, where spent time at al-Faruq, an al-Qaeda training camp near Kandahar. He was sent to meet 9/11 architect Khalid Sheikh Mohammed (KSM) in Karachi after either Osama bin Laden or al-Qaeda military commander Mohammed Atef found out that he was a trained pilot.National Commission on Terrorist Attacks upon the United States, Thomas H. Kean, and Lee Hamilton. 2004. The 9/11 Commission report: final report of the National Commission on Terrorist Attacks upon the United States. (Washington, D.C.): 226, http://govinfo.library.unt.edu/911/report/911Report.pdf. All of the hijackers, including Hanjour, volunteered for suicide missions.National Commission on Terrorist Attacks upon the United States, Thomas H. Kean, and Lee Hamilton. 2004. The 9/11 Commission report: final report of the National Commission on Terrorist Attacks upon the United States. (Washington, D.C.): 234, http://govinfo.library.unt.edu/911/report/911Report.pdf. Federal Bureau of Investigation, “9/11 Chronology Part 02 of 02,” accessed July 7, 2017, 111, https://vault.fbi.gov/9-11%20Commission%20Report/9-11-chronology-part-02-of-02/. Hanjour enrolled in refresher training at his old flight school, Arizona Aviation, and also trained at the Pan Am Internation Flight Academy in Mesa, but according to the 9/11 report, he was repeatedly advised to discontinue when instructors found his work “well below standard.” Nonetheless, Hanjour continued and completed his training in March of 2001, at which point he drove east with Hazmi to await the arrival of the “muscle hijackers,” who would help al-Qaeda’s pilots take over the 9/11 planes. They arrived in Falls Church, Virginia, by April 4, 2001.National Commission on Terrorist Attacks upon the United States, Thomas H. Kean, and Lee Hamilton. 2004. The 9/11 Commission report: final report of the National Commission on Terrorist Attacks upon the United States. (Washington, D.C.): 226-7, http://govinfo.library.unt.edu/911/report/911Report.pdf. Federal Bureau of Investigation, “9/11 Chronology Part 01 of 02,” accessed July 10, 2017, 132, 141, https://vault.fbi.gov/9-11%20Commission%20Report/9-11-chronology-part-01-of-02/. National Commission on Terrorist Attacks upon the United States, Thomas H. Kean, and Lee Hamilton. 2004. The 9/11 Commission report: final report of the National Commission on Terrorist Attacks upon the United States. (Washington, D.C.): 248, http://govinfo.library.unt.edu/911/report/911Report.pdf. On August 31, Hanjour purchased his ticket for American Airlines Flight 77, bound from Washington, D.C. to Los Angeles, at a travel agency in New Jersey.“9/11 Chronology Part 02 of 02,” Federal Bureau of Investigation, accessed July 7, 2017, 217, 220, https://vault.fbi.gov/9-11%20Commission%20Report/9-11-chronology-part-02-of-02/. 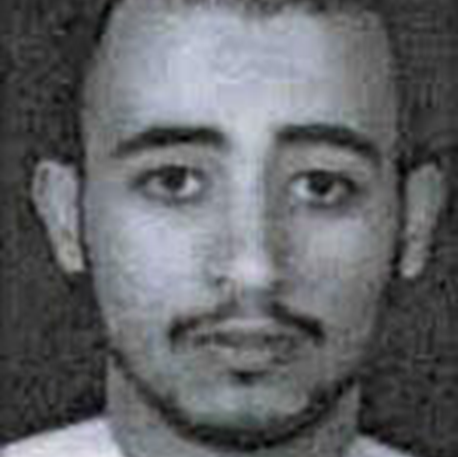 On the morning of September 11, 2001, Hani Hanjour and the four other hijackers of American Airlines Flight 77 checked in between 7:15 and 7:35 a.m. for the flight, scheduled to depart at 8:10 a.m., at Washington Dulles International Airport.National Commission on Terrorist Attacks upon the United States, Thomas H. Kean, and Lee Hamilton. 2004. The 9/11 Commission report: final report of the National Commission on Terrorist Attacks upon the United States. (Washington, D.C.): 2-3, 8, http://govinfo.library.unt.edu/911/report/911Report.pdf. Hanjour and two others were selected by a computerized prescreening system at the airport, but were ultimately able to clear the security checkpoint and board the plane without issue. Hanjour sat in seat 1B, in the first-class cabin.National Commission on Terrorist Attacks upon the United States, Thomas H. Kean, and Lee Hamilton. 2004. The 9/11 Commission report: final report of the National Commission on Terrorist Attacks upon the United States. (Washington, D.C.): 3-4, http://govinfo.library.unt.edu/911/report/911Report.pdf. American Airlines Flight 77 departed from the ground at 8:20 a.m.National Commission on Terrorist Attacks upon the United States, Thomas H. Kean, and Lee Hamilton. 2004. The 9/11 Commission report: final report of the National Commission on Terrorist Attacks upon the United States. (Washington, D.C.): 8, http://govinfo.library.unt.edu/911/report/911Report.pdf. The plane hijacking on American Airlines Flight 77 began sometime between 8:51 and 8:54 a.m.National Commission on Terrorist Attacks upon the United States, Thomas H. Kean, and Lee Hamilton. 2004. The 9/11 Commission report: final report of the National Commission on Terrorist Attacks upon the United States. (Washington, D.C.): 8, http://govinfo.library.unt.edu/911/report/911Report.pdf. According to reports from passengers and flight attendants who made calls before the plane crashed, the hijackers used knives and possibly box cutters to carry out the hijacking, forcing the passengers to move to the back of the plane so that Hani Hanjour could enter the cockpit and take control of the aircraft. At some point, Hanjour made an announcement that the plane had been hijacked.National Commission on Terrorist Attacks upon the United States, Thomas H. Kean, and Lee Hamilton. 2004. The 9/11 Commission report: final report of the National Commission on Terrorist Attacks upon the United States. (Washington, D.C.): 8, http://govinfo.library.unt.edu/911/report/911Report.pdf. At 8:54 a.m., the aircraft veered off course, turning back toward Washington D.C., and at 9:00 a.m., communications with the plane were lost. At 9:34 a.m., the aircraft made a 330-degree turn and began a 2,200-ft descent toward downtown Washington, D.C. Hanjour advanced the aircraft’s throttles to maximum power and began a high-speed dive toward the Pentagon.National Commission on Terrorist Attacks upon the United States, Thomas H. Kean, and Lee Hamilton. 2004. The 9/11 Commission report: final report of the National Commission on Terrorist Attacks upon the United States. (Washington, D.C.): 9, 334, http://govinfo.library.unt.edu/911/report/911Report.pdf. At 9:37 a.m., American Airlines Flight 77 crashed into the Pentagon at approximately 530 miles per hour, instantly killing everyone on board and an unknown number of people in the building.National Commission on Terrorist Attacks upon the United States, Thomas H. Kean, and Lee Hamilton. 2004. The 9/11 Commission report: final report of the National Commission on Terrorist Attacks upon the United States. (Washington, D.C.): 10, http://govinfo.library.unt.edu/911/report/911Report.pdf. The 9/11 attacks—including attacks on the World Trade Center, the Pentagon, and the thwarted attack headed for the White House or Capitol—left nearly 3,000 people dead in the single deadliest attack in U.S. history.National Commission on Terrorist Attacks upon the United States, Thomas H. Kean, and Lee Hamilton. 2004. The 9/11 Commission report: final report of the National Commission on Terrorist Attacks upon the United States. (Washington, D.C.): 7, http://govinfo.library.unt.edu/911/report/911Report.pdf. Ha HanjourUnited States District Court Eastern District of Virginia, “Hijacker True Name Usage Chart for 2001,” accessed July 10, 2017, 21, http://www.vaed.uscourts.gov/notablecases/moussaoui/exhibits/prosecution/OG00013.pdf. Hami HanjoorUnited States District Court Eastern District of Virginia, “Hijacker True Name Usage Chart for 2001,” accessed July 10, 2017, 12, http://www.vaed.uscourts.gov/notablecases/moussaoui/exhibits/prosecution/OG00013.pdf. Hami Saleh HanjoorUnited States District Court Eastern District of Virginia, “Hijacker True Name Usage Chart for 2001,” accessed July 10, 2017, 25, http://www.vaed.uscourts.gov/notablecases/moussaoui/exhibits/prosecution/OG00013.pdf. [email protected]“9/11 Chronology Part 02 of 02,” Federal Bureau of Investigation, accessed July 7, 2017, 166, https://vault.fbi.gov/9-11%20Commission%20Report/9-11-chronology-part-02-of-02/. Hani Hanjoor“Hijacker True Name Usage Chart for 2001,” United States District Court Eastern District of Virginia, accessed July 10, 2017, 7, http://www.vaed.uscourts.gov/notablecases/moussaoui/exhibits/prosecution/OG00013.pdf. Hani Hanjou“Hijacker True Name Usage Chart for 2001,” United States District Court Eastern District of Virginia, accessed July 10, 2017, 25, http://www.vaed.uscourts.gov/notablecases/moussaoui/exhibits/prosecution/OG00013.pdf. Hani Hanjour-Hanjour“Hijacker True Name Usage Chart for 2001,” United States District Court Eastern District of Virginia, accessed July 10, 2017, 4, http://www.vaed.uscourts.gov/notablecases/moussaoui/exhibits/prosecution/OG00013.pdf. Hani Hanjur“The Plot and the Plotters,” National Security Archive, June 1, 2003, 1, https://assets.documentcloud.org/documents/368989/2003-06-01-11-september-the-plot-and-the.pdf. Hani S H Hanjoor“Hijacker True Name Usage Chart for 2001,” United States District Court Eastern District of Virginia, accessed July 10, 2017, 10, http://www.vaed.uscourts.gov/notablecases/moussaoui/exhibits/prosecution/OG00013.pdf. Hani S H Hanjour“Hijacker True Name Usage Chart for 2001,” United States District Court Eastern District of Virginia, accessed July 10, 2017, 10, http://www.vaed.uscourts.gov/notablecases/moussaoui/exhibits/prosecution/OG00013.pdf. Hani S. H. Hanjoor“Hijacker True Name Usage Chart for 2001,” United States District Court Eastern District of Virginia, accessed July 10, 2017, 8, http://www.vaed.uscourts.gov/notablecases/moussaoui/exhibits/prosecution/OG00013.pdf. Hani S. H. Hanjour“Hijacker True Name Usage Chart for 2001,” United States District Court Eastern District of Virginia, accessed July 10, 2017, 4, http://www.vaed.uscourts.gov/notablecases/moussaoui/exhibits/prosecution/OG00013.pdf. Hani S. Hanjour“Hijacker True Name Usage Chart for 2001,” United States District Court Eastern District of Virginia, accessed July 10, 2017, 21, http://www.vaed.uscourts.gov/notablecases/moussaoui/exhibits/prosecution/OG00013.pdf. Hani Saleh“Hijacker True Name Usage Chart for 2001,” United States District Court Eastern District of Virginia, accessed July 10, 2017, 5, http://www.vaed.uscourts.gov/notablecases/moussaoui/exhibits/prosecution/OG00013.pdf. Hani Saleh Hanjoor“Hijacker True Name Usage Chart for 2001,” United States District Court Eastern District of Virginia, accessed July 10, 2017, 15, http://www.vaed.uscourts.gov/notablecases/moussaoui/exhibits/prosecution/OG00013.pdf. Hani Salih Hasan HanjurNational Security Archive, “The Plot and the Plotters,” Central Intelligence Agency Intelligence Report, June 1, 2003, 48, https://assets.documentcloud.org/documents/368989/2003-06-01-11-september-the-plot-and-the.pdf. Hani Saleh Hassan“Hijacker True Name Usage Chart for 2001,” United States District Court Eastern District of Virginia, accessed July 10, 2017, 26, http://www.vaed.uscourts.gov/notablecases/moussaoui/exhibits/prosecution/OG00013.pdf. Hani Saleh Hassan Hanjoor“Hijacker True Name Usage Chart for 2001,” United States District Court Eastern District of Virginia, accessed July 10, 2017, 15, http://www.vaed.uscourts.gov/notablecases/moussaoui/exhibits/prosecution/OG00013.pdf. [email protected]“9/11 Chronology Part 01 of 02,” Federal Bureau of Investigation, accessed July 7, 2017, 88, https://vault.fbi.gov/9-11%20Commission%20Report/9-11-chronology-part-01-of-02/. Hanjor“Hijacker True Name Usage Chart for 2001,” United States District Court Eastern District of Virginia, accessed July 10, 2017, 4, http://www.vaed.uscourts.gov/notablecases/moussaoui/exhibits/prosecution/OG00013.pdf. Hany Saleh“Hijacker True Name Usage Chart for 2001,” United States District Court Eastern District of Virginia, accessed July 10, 2017, 4, http://www.vaed.uscourts.gov/notablecases/moussaoui/exhibits/prosecution/OG00013.pdf. Hani Hanjour was the hijacker-pilot of American Airlines Flight 77, flown into the Pentagon as the third of the four 9/11 plane hijackings.National Commission on Terrorist Attacks upon the United States, Thomas H.